Artistic and unexpected florals have my vote for trend pieces of choice. Floral jackets and blazers (see here) combine strength with the unabashed feminine print that makes the wearer look like an instant fashion star. Drool worth item of day though is the new Proenza Schouler Ps1, perfect for the edgier fashionista who still wants to embrace the season. Looove that floral skirt on Natalia!!! Also, lovin' the floral heels...one of my new fave things for spring. I love that these have a hard, almost rocker, edge to them...want! The first group of pictures, very Titania a la A Midsummer Night's Dream - I LOVE IT! Now to the bits of beauty we can actually get our mitts on...those shoes, that dress, that jumpsuit! AHH! I really love the floral trend as well. I like that girls are wearing floral wreaths in their hair, too! It's whimsical and so 60s. 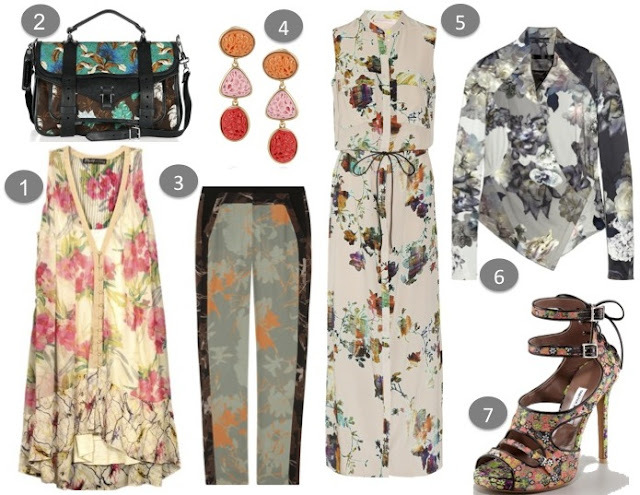 I love floral prints,they are so cool and have a romantic vibe! Love your blog, it so cool!Im following dear! So addicted to your blog!! Following, dear, hope you stop by and follow back! I want #1... I can't afford! 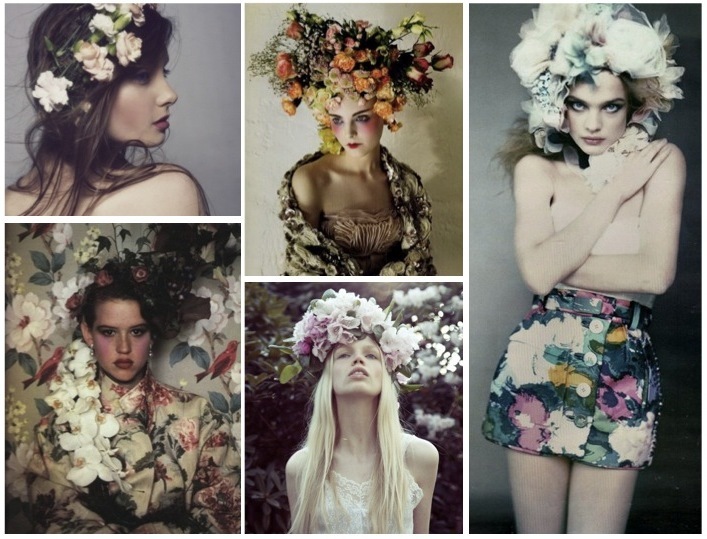 And if I could wear flowers in my hair like the top left pic, I would every day! I'm not joking. Following you! That photo of Molly Ringwald is SO cool. And I totally wish that dress (5) was in my closet! So beautiful! I absolutely love dreamy floral prints! I love floral!! they looked so spring/summer!! thanks for dropping by our blog. It was such a sweet and nice comments! Thanks for following my blog dear! Followed you back. These flora hair wreaths are just so intricate and amazing! Gorgeous pics, and I love florals. I am so obsessed with floral patterns. such an inspirative post. beautiful post!! !i'm following your blog!!!! I blogged about those same oscar de la renta earrings about a month ago! To dieeee for! great picks! I love these pictures. So stunning! Really nice post! I love it! So lovely blog and great post!!! love floral! These photos are fabulous, very inspirational. I love the short dress at number one, the pattern is really beautiful. Lovin' all the floral pieces - so pretty! I am right there with you!! I cannot get enough of floral yumminess!! Um, and I seriously swoon every time I see a floral headdress!! Wonderful post! great pieces!love the floral print! lovely floral items! bet u'd look great in them! Those photos are just gorgeous! I think it takes it a step beyond the floral trend since there's something fanciful and mystic about those photos instead of the typical happy sunshiny bright florals we tend to see now. Love this inspiration! Thanks for voting! These florals are amazing! And the clothes choices you put together are all so great. I want to earrings in my jewelry box right now! Give-away: win a IKKS €150,- shopping voucher!! Thanks for your comment lovely! This is such an inspirational post! The first collage is absolutely gorgeous! !